A wise man once said of the hand-capturing Pringles tube, “Sometimes you gotta let those hard-to-reach chips go.” Designer Dohyuk Kwon wasn’t satisfied to tip the tube over to let gravity deliver the chips into his hand, however, so he set about creating a frustration-free potato chip tube. 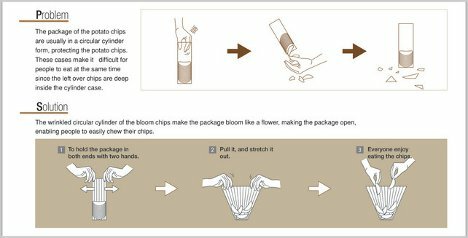 The Bloom package starts out as a tube (which protects the delicate potato discs inside) and then “blooms” into a bowl, making it simple to reach even those stubborn chip fragments on the very bottom. The Red Dot Award-winning design is basically a wrinkled cylinder held in place with a paper band. When you get it and its delicious cargo home, you remove the paper band and pull the tube open. It forms a kind of narrow bowl, allowing your hands easy access to every last chip. Of course, the idea behind the Bloom concept is to share those Pringles, and if you’re anything like us you might prefer the current package for just that reason.